There’s little question that Gilad has had a powerful shaping influence on the ensemble’s budding musicians, many of whom have gone on to play in professional orchestras the world over. But his reputation as a clarinet teacher, both at Colburn and at the University of Southern California’s Thornton School of Music, is second to none. Here again, the number of his students who have become professional musicians is testament to his skill and dedication. One former student, Todd Cope, principal clarinet of the Montreal Symphony Orchestra, said Gilad’s level of preparation paved the way for successful auditions. “I still play for him once or twice a year,” Cope says. “Once you’re a Gilad student, you’re his student for life.” The New York Philharmonic, the Cincinnati Symphony, the Minnesota Orchestra, and the Stockholm, Hong Kong, and Seoul philharmonics all have former Gilad students in their ranks. 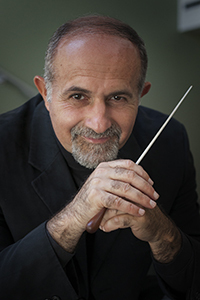 Prior to Colburn, Gilad served for 15 years as music director of the Colonial Symphony of New Jersey, transforming it, according to The Star-Ledger, “into one of [New Jersey’s] artistic trendsetters.” He has also served as music director of the Thornton Chamber Orchestra and the Santa Monica Symphony Orchestra and has guest-conducted internationally. In 1987 he became the first Israeli-born conductor to perform in China. He continues to tour as a clarinetist as well.